In the past, I said the time for Youtube advertising is now, but I didn’t talk about ‘how’ you could get started. This post will address that. 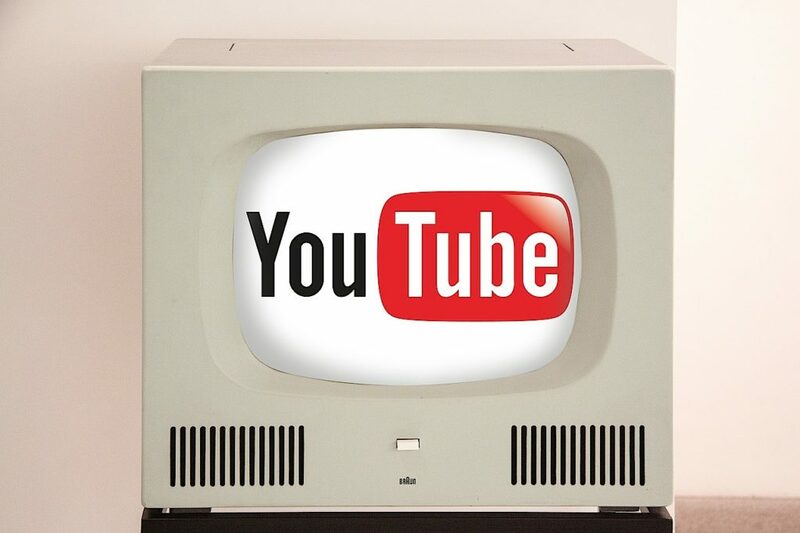 Free Bonus Download: I put together a resource for serious marketers who want to get started with YouTube advertising. Want the checklist? Click here to download it free. YouTube ads are a fantastic overall deal right now. You aren’t charged for TrueView in-stream ads until the viewer passes 30 seconds or finishes the video plus the cheap cost per view and you have something with real potential. Of course, if you are in a regulated niche or an industry that doesn’t use YouTube much, you might not be as lucky. But that doesn’t mean you shouldn’t at least test it out. The first step is having a video for obvious reasons. If you don’t have the resources to create a video, there’s no problem with outsourcing. Two companies I recommend for creating explainer videos are: Demo Duck and Switch Video. Like any paid advertising campaign, you want to make sure to narrow down your targeting to make the most of your spend. YouTube provides a large variety of targeting options. The more targeting options you select, the more targeted your campaign becomes so keep that in mind. On the right, you’ll see the venn diagram has become super targeted because of the multiple options we’ve selected. Remove some options to broaden your campaign. 5. Search – select any keywords you want to show up for when people search in YouTube. You can use Google Keyword Planner or Ubersuggest. 6. Display – when you’re selecting display keywords, make sure the keywords are tightly themed so YouTube knows what to associate your ad with. 8. Placements – if you know where you want your site to be on, the ability to add manual placements is an option. Retargeting also falls into this bucket. When I first started running YouTube ads, I was having issues getting traction until my Google representative graciously stepped in and gave me a few pointers. The big thing is making sure you’re bidding competitively on the areas that matter to you. For example, if I care more about inStream ads because I want to focus on pre-roll videos, I’d focus more of my bidding towards that. 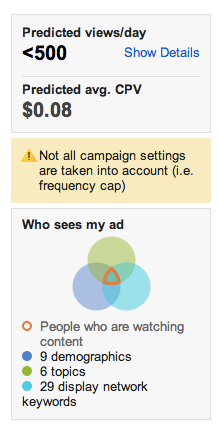 Go into your campaign, go to the ‘Targets’ tab, and edit your targeting group in the ‘All targeting groups’ section. 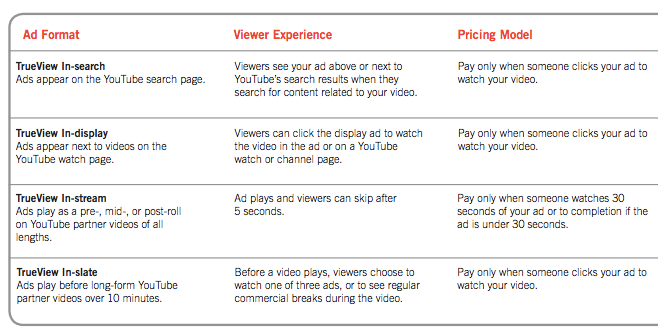 Then go into the ‘Bidding’ section and expand the ‘Max Cost Per View’ section. You’ll see three bidding options available: In-search, In-display, In-stream. Adjust your bids accordingly. Yep, you utilize retargeting with YouTube videos! Great for branding and in some cases even locking in the deal. 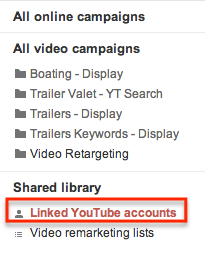 To find this, simply go into your video campaigns section and look for ‘Video remarketing lists’ on the left side. You can also use videos to retarget existing retargeting lists as well. For example, let’s say I run a SaaS company and I made a video for people that are deeper in my marketing funnel. Perhaps it’s someone that has visited my pricing and services page. I can target those people specifically and hit them with a video letting them know that there’s a limited time discount for the first month just for them to try to get them to convert. Lots of different possibilities with video retargeting so get creative! A Call-To-Action overlay is a great way to run a free ad inside your video if you’re trying to get your viewer to do something. You might as well add this in because it’s available to you at no extra charge. To get here, go to the ‘Videos’ tab and click on ‘Add Call-to-Action overlay’. In the point above, we talked about how the CTA overlay is something you might as well take advantage of. Well, there’s more to that. You can actually add banner ads when your video is showing as well. 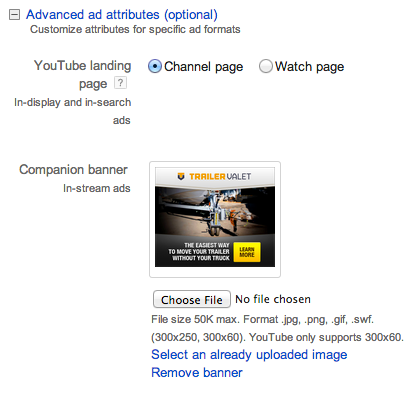 To get here, click on the ‘Ads’ tab and click on the ‘Advanced ad attributes (optional)’ link to open it up. At the end of the day, I care about whether I’m getting conversions at an acceptable price. Unfortunately, Google doesn’t break out its reporting for marketers that easily. Your default view won’t have conversions or cost/conversion showing up. It won’t have impression share either. You can solve all of this by going to ‘Campaigns’ and clicking on ‘Columns’ and choosing the metrics you want to show up in your dashboard. YouTube advertising is still in fairly early stages and not a lot of people are taking advantage yet so it’s a good time to jump in. It integrates well with what you’re already doing on AdWords and it’s fairly cheap to start branding yourself. I’ve heard stories from friends that say YouTube is a powerful channel where people might not convert initially, but will come back later and convert based off data they’re getting from multi-channel attribution. There’s no reason not to try this if you’re doing AdWords successfully already. So go do it! Ep06: Zapier CEO Wade Foster Talks About Building A Company Remotely, Growth & More!